HARVARD COLLEGE. Broadside. List of Graduating Students and Theses for Disputation. Boston, Massachusetts: Samuel Hall, 1791. 1 p., 18 x 22 in. 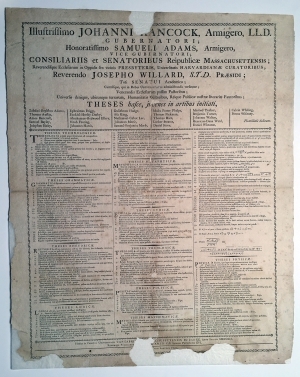 The Theses broadsides display propositions and questions respectively, used in the Commencement tradition of public student disputation which began at Harvard College in 1642. The practice was instituted under the leadership of President Henry Dunster (president from 1640-1654) within a larger effort to model the college after European universities. Behind the printed broadsides was a multi-stage process that involved both students and faculty. The Latin theses were academic statements created by the graduating students to reflect the scope of their undergraduate study. The Theses fit within a curriculum that emphasized public discourse and syllogistic debate and ranged between approximately 50 and 250 propositions in most years. This broadside includes theses in technology, grammar, rhetoric, logic, metaphysics, ethics, theology, politics, mathematics, and physics. Printed at the expense of the graduating class, the Theses were posted in advance, and graduates were expected to be able to defend them upon request. Certain students were selected by the faculty to discuss and dispute specific Theses publicly as part of the exercises. From the first commencement in 1642, through 1810, Theses were listed in broadsides. They were supplemented from 1791 onward by the Order of Exercises for Commencement, printed in English. The last Order of Exercises was printed in 1810, and subsequent Theses were distributed as quartos until they were replaced in 1821 by a Commencement program. Generally, the ceremony for students receiving their Bachelor’s degrees occurred in the morning and was followed by the Master’s degree ceremony in the afternoon. John Hancock (1737-1793) was born in Massachusetts and graduated from Harvard College in 1754. When his father died in 1764, Hancock became one of the wealthiest men in the colonies. He emerged as a leader in Boston’s opposition to British policies and was elected as one of Boston’s selectmen in 1765. Elected to the Massachusetts House of Representatives in 1766, Hancock learned from Samuel Adams, who gave him support and advice. Remaining in Boston while other patriots were away at the First Continental Congress, the Provincial Congress did elect Hancock as a delegate to the Second Continental Congress, where he was elected President. He likely signed the Declaration of Independence on July 4, 1776, witnessed in signature by Charles Thomson, secretary of the Congress. No other delegates signed the Declaration until weeks later. Hancock served as president until October 1777, when he took a leave of absence and returned to Massachusetts. He served as treasurer of Harvard College from 1773 to 1777. Hancock returned to Congress in 1778 and signed the Articles of Confederation. After adoption of the Massachusetts Constitution, voters overwhelmingly elected Hancock as the state’s first governor. He served from 1780 to 1785, and again as third governor from 1787 to 1793, when Samuel Adams served as his Lieutenant Governor. Samuel Adams (1722-1803) was born in Boston and graduated from Harvard College in 1740. He earned a master’s degree there in 1743. With little interest in business, he soon began writing political essays and was first elected to political office in 1747. In 1756, he became a tax collector but often failed to collect, which made him friends but left him deeply in debt. He opposed British efforts to enforce tighter control over the North American colonies. Adams served in the Massachusetts House of Representatives from 1765 to 1774, where he allied closely with John Hancock. He represented Massachusetts at the First and Second Continental Congresses, where he signed the Declaration of Independence. He and Hancock went separate ways in the Continental Congress, and their feud continued in Massachusetts. He served as an opponent of the proposed U.S. Constitution at the Massachusetts ratifying convention, but he and Hancock had reconciled, and they both agreed to support the Constitution but wanted the addition of a Bill of Rights. Elected Lieutenant Governor of Massachusetts in 1789, Adams served in that office until Governor John Hancock died in 1793, when he became acting governor. Adams was elected Governor in 1794 and served until 1797.